When Hannibal wanted to test early Rome, he brought 34 elephants over the Alps. Good weapons--bad route. 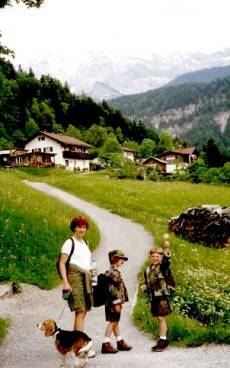 He lost most of them in the high altitudes. This coin (Widow's Mite) is a bronze coin issued by King Alexander Jannaeus, the Great Grand Nephew of Judah Macabee and the Jewish leader of the Holy Land from 103-76 BCE (Jannaeus wiped out the population at Gaza, then crucified 800 of his opponents; he expanded Israel to its greatest extent before handing over power to his wife--Salome Alexander, the only Jewish queen). 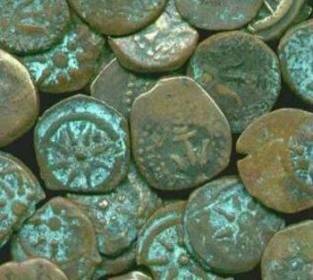 It is this type of coin that circulated in the Holy Land during Jesus' life. The two dominant symbols that are found on the coin are an anchor and a star with 8 rays. The anchor was adopted from the Seleucids, who used it to symbolize their naval strength. Anchors are depicted upside down, as they would be seen hung on the side of a boat ready for use. The star symbolizes heaven. The diadem symbolizes royalty. The Roman Empire spread through all Europe. 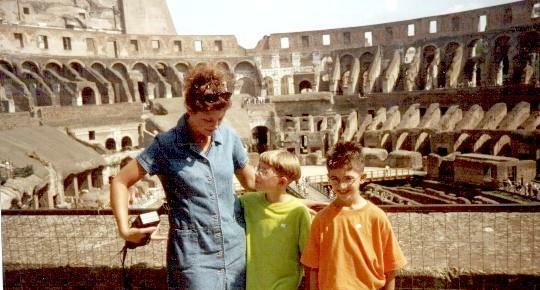 So far, in fact, that Rome lost control in later years. Remnants of Rome's walls, gates, and amphitheaters still stand throughout Europe. In 179 CE the Roman fortress Castra Regina ("fortress by the river Regen") was founded for the Third Italic Legion during the reign of Emperor Marcus Aurelius. 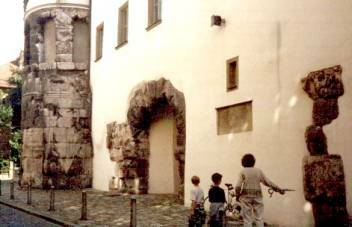 The Porta Praetoria in Regensburg, Germany was one of many gates to the fortress. After a Jewish revolt, the Roman General Titus destroyed Jerusalem in 70 CE. 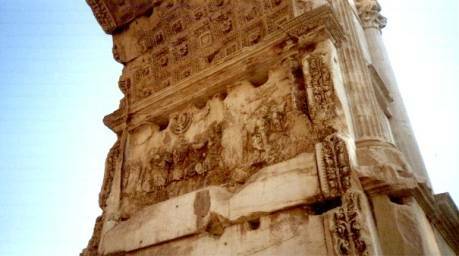 The arch commemorating his victory depicts soldiers carrying away treasures out of the temple. He was nice enough, though, to leave one wall remaining at Herod's temple (on the west side). Rome used the plunder from Jerusalem to fund the 80 thousand-seat capacity Coliseum. By the way, Herod’s Temple blocks on the retaining wall are 42X11X14, and 600 tons each. Yeah, that’s bigger than the Pyramid blocks. The Temple mount area is equivalent to 30 football fields. You think Herod was trying to win over the Jews? Galerius was brother-in-law to Diocletian (who dished out the most severe persecutions Christian ever endured). He was appointed governor of Balkans and chose Thessaloniki as his base. 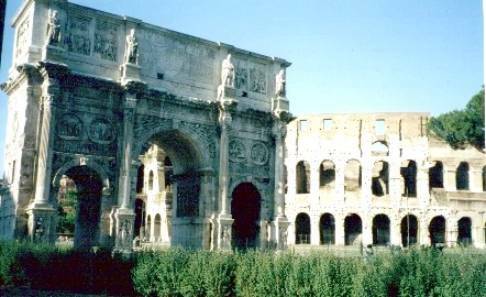 The Arch of Galerius was built in his honor upon his triumphal return from a victorious campaign against the Persians (305 CE). 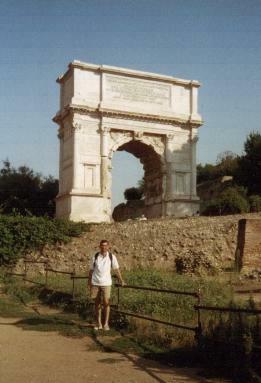 The Via Egnatia ran underneath the arch. The Roman Gate at Trier (Porta Nigra, 2nd cent.) 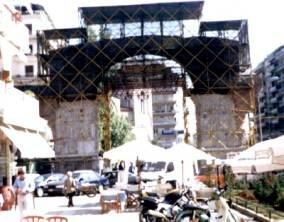 is the largest Roman Gate north of the Alps. 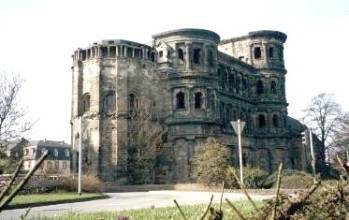 Trier, the oldest city in Germany, was established in 16 BCE by Augustus. It was Constantine's capital city before the battle of Milvian Bridge. Shortly after Christ died, Paul of Tarsus took Christ's message to the world. 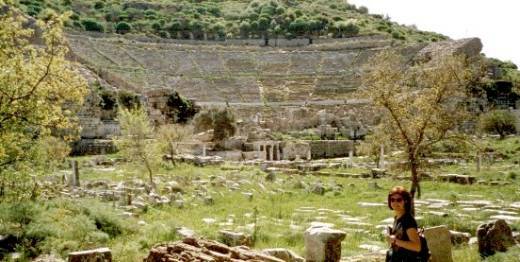 On one particular stop in Ephesus, he caused an uproar when his preaching threatened to bring down sales of Artemis statuettes. With the help of inspired writers like Peter, Paul, and John, letters from Christ's apostles began to circulate throughout the Roman Empire. Copies were made in various places. Some of these copies ended up in a monastery in Egypt (St. Catherine's on Mt. Sinai). 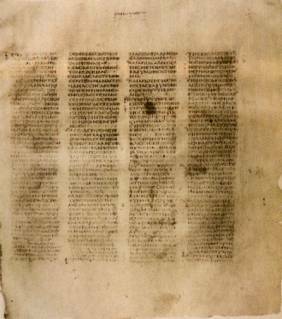 Codex Sinaiticus is one of the most important finds in Biblical literature. It is a 4th century manuscript which originally contained the entire Old and New Testaments, discovered by Constantin von Tischendorf in 1844. Not until 313 CE did Christians win the right to worship freely and win converts to Christ. Constantine made this possible after a victory over his chief rival to the throne, Maxentius, at which--tradition holds--Constantine claimed to have won by the "sign of the cross" (whatever that means). Here is the arch commemorating that victory. This first coin (Camp-Gate of Constantine) is an early camp gate reverse of Constantine I. The abstract representation of the fortified portcullis and gate of a permanent Roman army fort or garrison town is intended to symbolize the power of the Roman army to protect the empire's subjects from civil war and external invasion. The style as well as the size of these camp gate coins changed over the next 140 years. There is no evidence that the camp--or perhaps city--gate shown refers to a specific edifice in Rome or elsewhere, but rather it represents the idea of strength and security provided by walls and the army at a time of disturbance. The other coin (Constantine with Standards) has a pearl-diademed head facing right on the obverse, and two soldiers with two standards on the reverse. 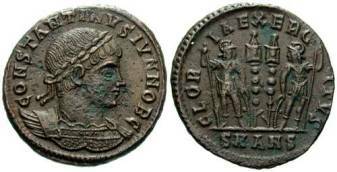 The obverse inscription reads CONSTANTINVSIVNNOBC (IVN--"the younger", meaning Constantine the Second; NOB--Nobilissimus, most highly regarded; C--Caesar. The reverse reads GLORIA EXERCITVS (meaning "Glory of the Army").